Do Guinea Pigs Like The Sun? It’s easy to think that coming from a hot continent such as South America, that guinea pigs would like the sun. Actually, the opposite is true in that they don’t like it at all. They much prefer to be in the shade and if they are caught in a patch of sunlight will look to shelter in the shade. Where they actually come from in the Andes mountains of South America is quite a cool place. The temperature is quite variable and it can actually get quite cold up there. They live at altitude when in the wild and so are used to keep trying to keep themselves as warm as possible in cold weather. They do not feel comfortable in the sun at all. This is why if you are keeping your guinea pigs outside or if they are just out in their run, then there must be some shade shelter for them. If there is not, they will look to make something for themselves to shelter under. For instance, when we got our first guinea pig ‘Rocket’, I didn’t realize this fact. I left him in his run without any shade on a particularly sunny day. When I returned to him, he had buried himself in the grass which was about 2-3 inches long in a patch. At this point, I realized that I should have been much kinder to him and given him to shelter. This is why I always leave somewhere where my piggies can shelter under from the sun. They will always take refuge on a hot day in the shade and try and stay as cool as possible. When the temperatures get over 75 degrees Fahrenheit they tend to start to overheat. They can’t cool down like we can and are trapped in their fur coats which are naturally designed to keep them warm. In extreme cases, they can even suffer from heat exhaustion and maybe death if they don’t find respite from it. Consider extra shading for the run and hutch. If they are outside then considering putting extra shading up such as a parasol or panels over the run or hutch to keep out the sun’s rays. Of you can bring your guinea pigs inside and it is safe to do so then this is the best option. They will enjoy the cooler option of being inside the home more and the provision of air conditioning if you have it. Have more shelters that they can hide away in. Again if they are outside then giving them smaller hidey homes to retreat to. They love to hide out in places and will enjoy finding new places to go. What about keeping them cool? One thing you can do to cool them down is to freeze some bottles of water. Then lay them down in their run for them to brush up against. Although this doesn’t solve the issue of being exposed to sunlight. Ensure they have constant access to water. Having constant access to water is vital for a guinea pig. It is reassuring for them to know that their water bottle is full when they need to drink from it so top it up daily with fresh water. Towels or blankets which have been soaked in cold water can also provide a good respite in hot conditions. Just lay them down on the run floor for a short time and let the guinea pigs walk over them. Don’t leave them there for too long though as they will start to smell. Should Guinea Pigs Be Kept Inside or Outside? 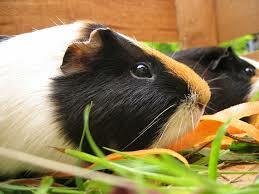 When guinea pigs are kept by an owner in the UK and other western countries, they are left outside in their hutches. This is because often people don’t like them inside the home or just don’t have room for them. But is this right? Well the answer to the question is it depends what the temperature is outside. What temperatures do guinea pigs enjoy the most? If the temperature goes below 15 degrees Celsius it’s time to bring them inside. If it goes below 10 degrees Celsius, then they should definitely be inside. Similarly, if the temperature goes above 25 degrees Celsius then it’s time time to think about bringing them inside. However they can deal with the hot better than the cold in my experience and will always seek out cool, and shaded areas. Guinea pigs are creatures who like dry environments with a cool temperature. They are very hardy creatures who can handle what comes there way as they have very good survival instincts. They can survive most environments, but do like extreme colds or hot weather. With this in mind a A stable temperature is much better for guinea pigs that a nice cool temperature is much more preferable to them. Depending on where you live this can mean that you have the right temperature that enables them to live outside most of the time, or in fact you may have to have them permanently inside as it would just be cruel to keep them outside shivering their little paws off. So do consider whether the home you have for them is in the right place for them before you set up a place for them there. It certainly took us a while to get this right. So the ideal situation is to have a place inside a home or an outhouse that is large enough for a pen/cage that they will enjoy living in. But also if you have the facilities to do this, when the temperature is right that they can live outside as well in a pen/cage that protects them when it gets wet.